Future Automobiles (Pvt) Ltd is a authorized dealer for Ford Automobiles in Sri Lanka announces their special price for the Ford Eco Sport Titanium as Rs. 5.6 Million all inclusive. The Ford Eco Sport Titanium is known for well performed SUV for Srilankan roads and fuel efficiency. Future automobile offers trade in and trade up promotion for your existing vehicle for more details see below image or contact to Future Automobiles (Pvt) Ltd Ford Centre, 1124/5, Parliament Road, Battaramulla. The MBA Alumi Association University of Colombo organized a forum of Budget 2016 with the Finance Minister, Hon. Ravi Karunanayake & key industry leaders at the Post-Budget forum. 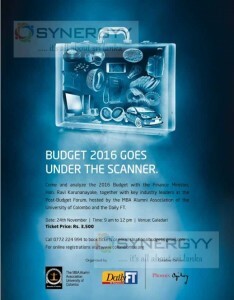 Take part of this forum and knew unseen background of Budget 2016 and thoughts of industrial leaders. This would usefull for businessmen, Financial analyst and those who key concern on budget 2016. 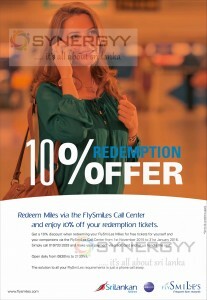 Sri lankan Airline has announces special discount of 10% when redeeming your FlySmiLes Miles for free tickets for yourself and your companions via the FlySmiLes Call Center from 1st November 2015 to 31st January 2016. Simply call 019733 3333 and make your payment via credit card and let us handle the rest. For more details contact Sri lankan Airlines FlySmile call center today 019733 3333 from 0830hrs to 2130hrs. RTS Trading is a sole agent for importing and distributing Electric Gold Car and personal transportation robots in Sri Lanka. You could purchases 4, 6 & 8 seater Electric Golf Cars and Personal Transportation Robots in different models are available. Dialog Axiata introduce a new mobile device of Dialog Suraksha for ensuring your child in safer and contactable at any given time. Dialog Suraksha is come with many features to ensuring children security, contactable and traceable where is your children is. Get the Dialog Suraksha mobile security device for your child today. For more information dial 1777. To purchase this device please bring child’s birth certificate to verify the identity. Introductory price is Rs. 4,990/- and Installment plans are available. For more details see below image or visit your nearest Dialog Customer Care Centres island wide. 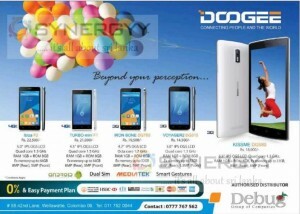 Debug Group of Company is an authorized dealer for the Doogee Mobiles in Sri Lanka introduce range of 3G and 4G LTE Mobiles at an affordable price. 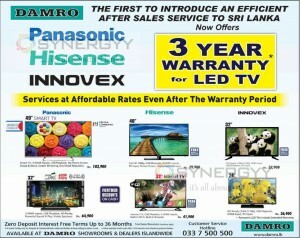 Damro made a revolution as introducing efficient after sales services in Sri Lanka for first time for branded LED TV with 3 years warranty. Even if you faced a problem after warranty period Damro promise that they would service at an affordable price to you. 36 month facility only for Sampath & Commercial Bank credit card holders & those willing to obtain a card, Other selected credit cards offer 12/24 months zero Interest payment schemes. Commercial Bank of Ceylon PLC is offering a highest interest rate for the fixed deposits in Sri Lanka, bank offers highest interest rate as 10.5% for 5 Years fixed Deposits and minimum of 4.25% for 1months Fixed Deposits. 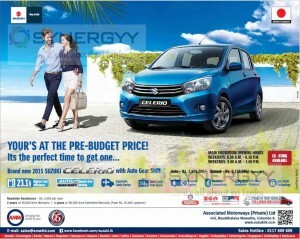 It is a common expectation that vehicle price will be increase after budget proposal on November 2015, therefore AMW offer you to a special price for Maruti Suzuki Celerio at a pre-budget price. And AMW offers Roadside Assistance Rs. 4,000 per year and 2 years or 50,000 kms Warranty / 4 years or 80,000 kms Extended Warranty (from Rs. 25,000 upwards). For more detail see below image or visit AMW at 445, Bauddhaloka Mawatha, Colombo 8 or contact to 0117 609 609. Cargills Bank, now open at Matara. 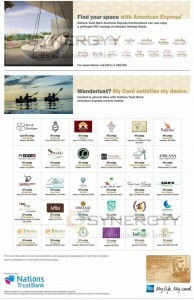 Posted on November 15, 2015 November 15, 2015 Categories Banks, Credit Cards, Loans, Leasing, Vechile Hire purchases, Sri Lanka Promotion and DiscountsTags bank loans sri lanka, bank of ceylon loans, Cargills (Ceylon) PLC, cargills Bank, Cargills Foodcity Offer, Cargills Foodcity Offer 2015, commercial bank loans, commercial bank online sri lanka, lanka bank loan, lanka bankuwa, licensed commercial bank in sri lankaLeave a comment on Cargills Bank, now open at Matara. 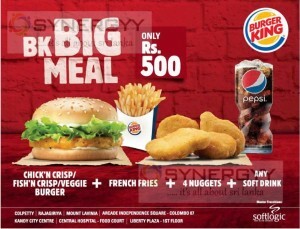 Burger King announces special promotion of Burger King Big Meal just for Rs. 500/-, the big meals come with ultimate big combo of Chick’n Crisp/ Fish’n Crisp/Veggie Burger+4 Nuggets+ French Fries+ Any Soft Drink. Tabz is a subsidiary of DPJ Holdings offers range of Apple and Mobile accessories into Sri Lanka introduce their high quality Bluetooth headset at a special price. Luxury meets efficiency in the new Mercedes-Benz E 300 Diesel Hybrid from DIMO. Experience the best of both worlds as you glide along in total comfort, knowing that you’re enjoying best-in-class fuel economy and superlative performance. Ensure that you receive the world-class care you and your vehicle deserve, including a hassle-free warranty, comprehensive service packages, and access to country-specific options when you purchase this luxuriously intelligent machine from DIMO. 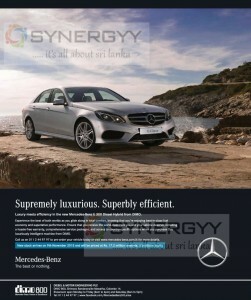 Call us on 011 2 44 97 97 to pre-order your vehicle today or visit www.mercedes-benz.com.lk for more details. 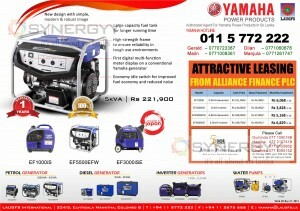 Laugfs International authorized agent for Yamaha Power Products in Sri Lanka brought you range of Yamaha Generators such as Petrol Generators, Diesel Generators, Inverter Generators and Water Pumps. Laugfs International offer you a convenience purchasing option with Aliiance Finance PLC Leasing Scheme without harming your finance. Are you a MBA student or MBA holder with 3 years work experience? Use your MBA for your family & for your future. If you say Yes; You stand a chance to Migrate to Australia, New Zealand or Canada. Abans is an authorized dealer for Hero Motor Cycles in Sri lanka launched an engine overhaul camp, exclusively for your Hero Motorbikes. 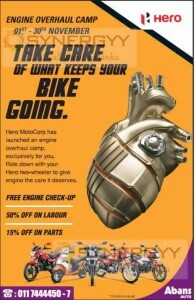 Ride down with your Hero two-wheeler to give engine the care it deserves. This offer is valid for free engine check-up and you may get 50% off on labour charge and 15% off on parts purchases in case your engine needs repairs. 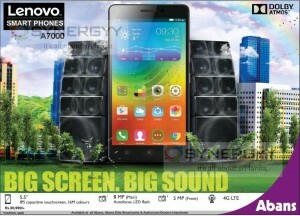 Abans introduce the Lenovo A7000 Smartphone for Rs. 30,990/-, Lenovo is commonly known are best selling mobiles in Central Asia and South East Asian countries. Lenovo A7000 is a 4G LTE smart phone with 5.5” IPS capacitive touch screen with 16million colours and it is comes with 5MP front camera and 8MP main camera with Autofocus with LED Flash. Surely the Lenovo A7000 would be value for money of Rs.30,990/- investment than major smart phone legend of Apple and Samsung. 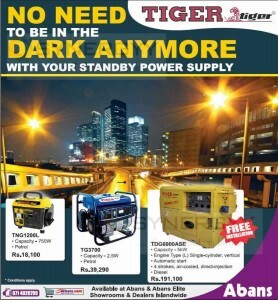 Abans announces a special promotion for the tiger generators in Sri Lanka, buy your Tiger generator from Abans and get free installation now. 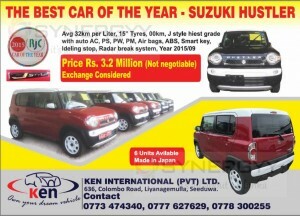 Ken International (Pvt) Ltd imported and distribute Suzuki Hustler Hybrid J Style cars in Sri Lanka for Rs.3.2 Million all inclusive. If you consider to exchange your old car for the Suzuki Hustler 2015 car here is an option too. be proud to own Suzuki Hustler as fresher into Sri Lankan market. Suzuki Hustler is well known for highest fuel consumption of 32km per Liter. And Suzuki Hustler comes with many more features like 15” Tyres,auto AC, Power Steering, Power Window, Power Mirror, Air bags, ABS, Smart key, Idling stop, Radar break system. You can check your G.C.E (A/L), G.C.E (O/L) & Grade 5 Scholarship Examination Result on Department of Examination of Sri Lanka website of www.doenets.lk. This website has encountered a slow in service due to the traffic so Department of Examination of Sri Lanka has launch new website of www.exams.gov.lk to cater same service. If you unable to visit any of above website you can check your result by using SMS. When direct flights combine with unbelievable discounts, how can you possibly resist? Prices you’ve only dreamed of to destinations of your dreams – and without the hassle of stops or transits anywhere! Whether you plan on flying business or economy, simply hop in and hop off at the destination of your dreams. Book now and you have till 31st March 2016 to travel! Pack up your bags and gather up your family – simply lend yourself into our care. Sit back, relax and let yourself sink into the lavishness of SriLankan hospitality. Sleep through the flight and open your eyes to a whole new day at your destination. Step out refreshed ready to explore and discover! But you need to make your bookings before the 30th November 2015 to grab this amazing offer. Offers this good wait for no one! Hurry! Limited seats available so make your bookings now! 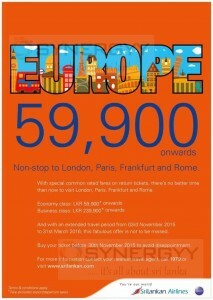 Offer is valid for return air tickets from Colombo to Frankfurt, London, Paris and Rome. Pizza Hut’s flagship restaurant at Union Place has been refurbished to bring an all new dining experience. The newly revamped restaurant has reopened its doors to bring customers the well loved flavours that Pizza Hut is known for, and is open for business from 11am – 11pm. Customers are warmly invited to sit down for a freshly made meal where they can choose from an array of pizzas, pastas, rice, soups & salads, appetisers, desserts and beverages. A new feature of the outlet is a beautifully constructed open kitchen, where customers get to witness their meals being prepared by the friendly Pizza Hut crew. The Bar Association of Sri Lanka in collaboration with the Justice Ministry and the Legal Aid Commission will organise the National Law Week 2015 under the theme, “Towards a Just and Law Abiding Society”. It will be held from November 23 to 29. At a media conference held at the Bar Association Auditorium in Hulftsdorp, BASL Chairman U.R. de Silva said the National Law Week would help people to know their rights with regard to legal matters. He said there have been several complaints by people who had been treated unlawfully by the police in this regard. “This is mainly for low-income people who face legal issues mainly because of financial constraints,” Mr. de Silva said. He invited those who need special assistance in handling their legal matters to inform BASL lawyers by calling the two hotline numbers: 011 3133864 or 011 3133862 before the Law Week begins on November 23.BASL President Geoffrey Alagaratnam said legal awareness programmes would be carried out in 55 different locations countrywide. The newly proposed Maradana to Battaramulla railway line hoping to reduce heavy traffic from maradana, boralla, rajagiriya and battaramulla. The government is considering its options in obtaining financial support from Asian Development Bank (ADB) to construct a new railway line from Maradana to Battaramulla. Official stated that government is planning to negotiate with the Asian Development Bank in January about the project. Initially, ADB informed that they would support the project, but the it is necessity to clarify the exact nature of assistance and finalize the agreement. The feasibility study on the construction of a 10km railway line would be based on the recommendations of a steering committee which had been appointed with the participation of the Transport Ministry, Sri Lanka Railways and Urban Development Authority officialsand the railway project would cater to over 20,000 government servants who travel to and from Battaramulla daily as most of the government institutions are now located in Battaramulla. Mihin Lanka will offer three weekly direct flights from Colombo to Chennai every Tuesday, Thursday and Sunday, which connects more passengers to this vibrant city in South India, from October 25 Since its launch in 2007, Mihin Lanka has come a long way, becoming one of the region’s most admired travel brands. In 2015, Mihin Lanka was ranked by Skytrax as the third best low-cost airline in Central Asia and India. The Skytrax Awards programme established in 1999, surveys 18.9 million airline passengers in 110 countries and bases its rankings on product quality and staff service standards. Mihin Lanka plays a crucial role in supporting regional connectivity, and recently enhanced its offering by introducing its new Business Class service. Mihin Lanka services corporate, business, pilgrim, and leisure travelers, by providing convenient direct flights to key destinations across the Indian Subcontinent, Asia and the Middle East. Mihin Lanka operates daily flights to Dhaka in Bangladesh, Jakarta in Indonesia and Madurai in India. The airline also operates five flights weekly to Bahrain in the Middle East and Lahore in Pakistan and thrice a week to Seychelles and Kolkata. Bodhgaya and Varanasi are seasonal flights and operate twice weekly. Enhancing the route network Mihin Lanka will commence operations in to Chennai thrice a week and plans to increase the frequency to four times a week.